Rose is easily the most versatile note in perfumery. For a start, there are many natural essences, distillations and absolutes of rose, each of which has its own character and odour profile which, interestingly enough is often far removed from the scent of roses on the bush, but that’s another article for another time. What’s more, rose is a masterfully complex note, boasting a wide-ranging odour profile that can be utilised in so many ways. This is because rose is made up of a number of chemical compounds that give the flower its unmistakable odour, including; (-)-cis-rose oxide (an intensely rosy odour), beta-damscenone (jammy, rich and rosy) and beta-ionone (the sweet earthy smell of violets). It also includes nerol (the hissy citrus aspects of rose), farnesol (a white floral-esque smell), linalool (a smell between lavender and bergamot), geraniol (the minty freshness of geraniums), eugenol (that clove-y smell of carnations) and (-)-citronellol (the fresher, more floral and cleaner aspects of rose), all of which contribute to its smell. So yes, rose is versatile AND complex. The complex nature of rose allows it to be treated in a number of different ways, resulting in jammy roses, spicy roses, creamy gourmand roses, rose soliflores and a whole host of others – too many to list in fact. The versatility of rose extends to its genderless nature too and over the years and the note has played a prominent role in both the feminine and masculine streams of perfumery, making for a somewhat androgynous note that can be worn by both sexes without feeling out of place. 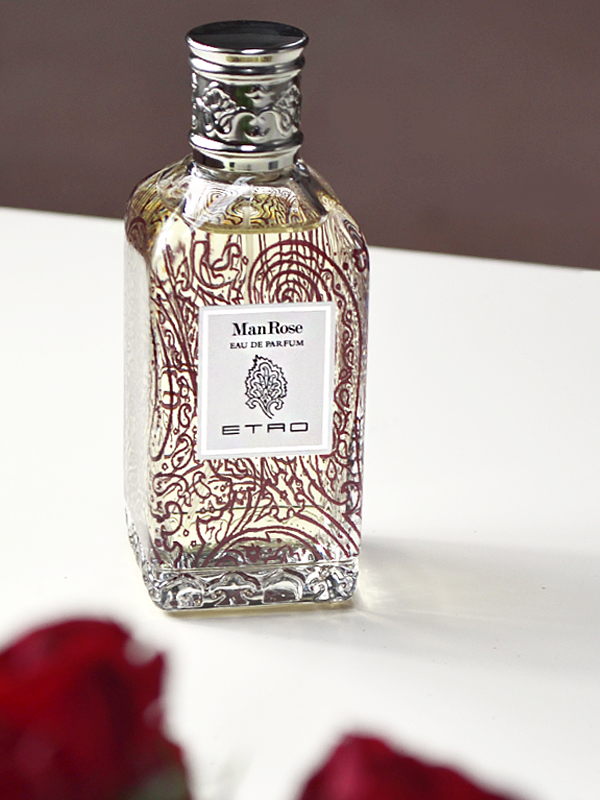 These contradictions are exactly what Etro are exploring with their rather interestingly named new fragrance: ManRose. Often I will use the term ‘luminous’ to describe an accord in a fragrance, but ManRose really does glow, nay it radiates as it comes out of the bottle. 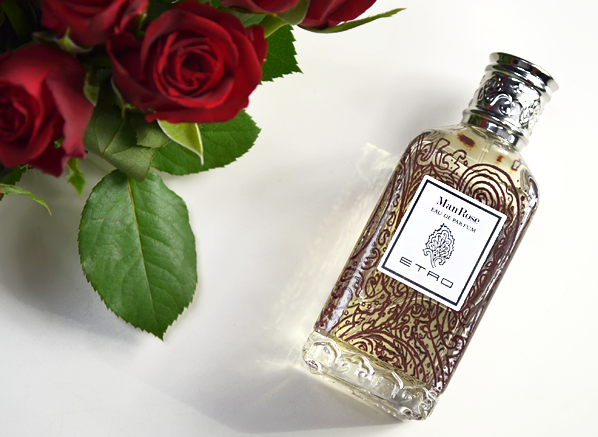 ManRose opens with a harmonic accord of bergamot and cardamom. The citrus brings a whiteout effect that refreshes and perks up the nose, whilst the cardamom immediately brings forward a spicy warmth that hints at the style of the fragrance that is due to unfurl. There’s also a minty geranium quality in the opening that links the freshness of the citrus to the bold rose note that dominates the character of the fragrance. The rose at the heart of ManRose is the most delectable and glowing flower. There’s a lot going on in this complex rose heart; it’s a fruity, jammy rose with a touch of carnation spice but also, on the contrasting side of this, a fresh, airy mint vibe that is wholly geranium-esque. It’s so juicy and sweet that it feels like a wave of Turkish Delight in the air, which make it a little hard to not to want to stuff your face with it, to be honest, and whilst it definitely has an edible facet, it’s never going to give you stomach ache due to its transparent nature. Think of it as Turkish Delight smoke and you’re on the right track. In the base, ManRose reveals its softer side, swapping rose for suede, woods and patchouli. Of course the character of this rose is so bold it’s not going to take a back seat to any other note, no matter how strong they are, but it does relent slightly, allowing for the dry warmth of the base to dissolve the sweetness somewhat. What’s left on the skin after a few hours is a delightful leathery rose with hints of salty vetiver and sour patchouli. It’s gorgeous all the way through. ManRose is a really gorgeous rose fragrance and despite the specific gendering of the name, it would easily work well on both sexes. I see it as a rather luminous rose made with bold colours. It’s a rich tapestry of reds, golds and browns sewn together with incandescent gold threads. ManRose is not a shy fragrance and for a masculine, it certainly makes a statement: it says I am a dude that knows how to smell good and whilst some guys might wear rose, I rock it. Now that is my kind of guy! • Which Flower by Kenzo fragrance is for you? This entry was posted on Wednesday, April 12th, 2017 at 11:43 am and is filed under Candy Perfume Boy, Fragrance, New products. You can follow any responses to this entry through the RSS 2.0 feed. You can skip to the end and leave a response. Pinging is currently not allowed.